Home / Release Notes / March 2019 – New in Let’s Talk! We’re launching a spring update in Let’s Talk! on March 29th, 2019! This release focuses on enhancing the most used page on the platform to further increase teamwork. 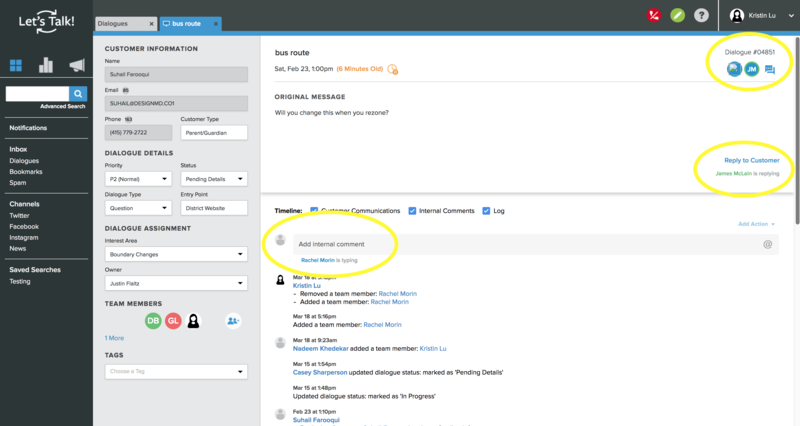 The dialogue page will now see new features such as forwarding options and real-time comments as well as upgrades such as a clean up on the dialogue details and timeline. A new design for dialogue details expands text boxes and clarifies editable fields within the section. Less confusion for users and more accurate data is recorded. Where did the three buttons go? Reply to Customer – is now its own button on the bottom right corner of the original message box. Why? Because it’s the expected next step to receiving a dialogue. Internal Comments – is now a text box within the timeline. Just type and post! Close Dialogue – is now found in the dialogue drop down found under the dialogue number. Why? We want our users to close their dialogues, but its a step after responding to clients, and any needed collaboration. Integrating Let’s Talk! further into the familiarity of emails – the ability to CC other addresses when replying to a customer will allow users to bring in whomever they need to into the loop without having to chase down the conversation outside of the system. Automatically saving customer replies as a draft has a very simple (but important) benefit: never lose your work again! Bonus: Option to save as a response template as well for future use using the save icon. 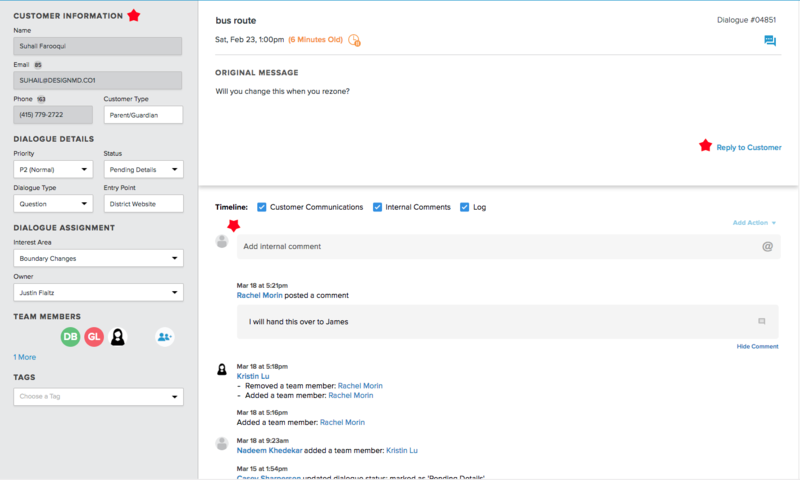 Real-time edits will allow users to truly collaborate (and not duplicate work) on the dialogues they’ve been assigned to. A simplified method of adding attachments to customer reply and internal comments. Working hyperlink in replies – A working hyperlink in the reply before sending it off allows users to check their work. Exclude date range from aging – Rather than having to exclude individual dates from aging, a range will reduce the time it takes to apply such settings for holidays or breaks. Interest Areas in tabs fall within categories – Similar to how it works on a landing page, it will break up the IAs accordingly on the tab for more accurate selection. Required interest area owner selection when users are removed interest area owners – This ensures that interest areas will always have an owner and reminds System Admins to select one when an owner is removed. Activity Log – Under Your Settings, System Admins now have the ability to see timestamped activities and changes that go on within the account. This includes activities such as generated reports and interest area changes. Have comments or feedback on the release? Let us know! I love the feature that shows when a person is working in a dialogue. FANTASTIC feature! Love love love being able to see the entire customer email address!!! The other updated and new features look great too! Can’t wait to try them out! Preferred to be able to “Post as closed” with one click. Now I have to click “Post”, then click a drop down, then click “Closed”. Granted, it’s only three mouse clicks, but it used to be only one.